Hi! 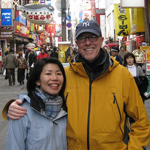 We’re Rick and Hiroko and we’re sake enthusiasts with a dream. Our dream? To share our excitement about premium sake with kindred spirits like you. Although we’ve tasted or drunk (yes, there is a difference) a number of different sake, we are always seeking to learn something new about our favorite beverage. We’ve sought to expand our knowledge under the tutelage of Sake Samurai John Gauntner at his Professional Sake Course in Tokyo, and visited sake breweries, numerous izakaya (sake pubs) and sake shops throughout Japan. We’ve also experimented at home with food pairings both Japanese and Western (cheese with sake? absolutely!) and yet we still realize that we’ve only nicked the tip of the sake “iceberg!” And we certainly don’t ever expect to master the subject either. If we did, we wouldn’t enjoy it so much! There is always more to explore and learn and we believe that much of the fun is in sharing that with you. Rick’s passion for sake began 6 years ago with a trip to the then-new East Village sushi restaurant Jewel Bako when he was Associate Publisher at Food & Wine Magazine. Their omakase dinner paired with a selection of different sake was a stunning revelation of its variety and versatility….served lightly chilled, it was nothing like that warm “jet fuel” that he’d had over the years prior at other sushi restaurants. As a long-time wine enthusiast, he was surprised to discover that sake too had an alluring abundance of aromatics and flavors, all from the deceptively simple combination of rice, water, koji, and yeast. That seminal experience launched a headlong pursuit of sake tasting anywhere the brew was available; the annual sake-tasting at The Japan Society, the large-scale Joy of Sake, and of course, numerous visits to Sakagura, our “research laboratory,” not to mention our more intimate sessions at home. The origin of Hiroko’s passion? Well, when you grow up in Japan where sake is an integral part of the culture, let us just say that it grew a bit more organically for her. Although there have been a number of Japanese restaurants in New York for years, there has been a recent surge in new izakaya-type restaurants such as Megu, Matsuri, and EN Japanese Brasserie (to name but a few) that serve dishes based on “homestyle” cooking for which sake is a perfect match. Along with this trend, sake has also permeated the beverage lists of non-Japanese restaurants such as Bouley, Chanterelle, Per Se, and Tocqueville, and in other Asian establishments such as the two Momofukus, Bao, and Sushi Samba. All of this has resulted in an ever-growing variety of opportunities to try and experience the pleasures of premium sake. We believe the time has come for New York to have its first shop specializing in premium sake. Our shop, Sakaya, will focus on acquainting, educating, and familiarizing patrons with the pleasures of drinking sake, and pairing them with food. We hope to offer a learning experience that not only creates an appreciation for sake but also for the Japanese culture from which it originates. Welcome to our introductory blog. We invite you to join us on our journey to fulfilling the dream. We’ll be sharing our experience as we build Sakaya, along with some basic information, fun facts, and insights into the cultural heritage of sake. We look forward to having you with us throughout the store’s gestation period and when we finally open our doors.